For Athens resident Saraquoia Bryant, marijuana legalization is about more than letting people get high, and she’s not happy with the way Ohio’s medical marijuana program is shaping up. Bryant, who owns Cool Digs Rock Shop, 6 Euclid Drive, is forthright about her stance on Ohio’s current medical cannabis law: “Our state medical law is a total scam,” Bryant said, speaking in the cramped back office of her shop in October. She was heated, in part, about the way the state is divvying up licenses to cultivate medical weed in Ohio. More than 100 starry-eyed investors hoping to cash in on the Ohio’s budding cannabis industry have submitted applications to become cultivators — along with non-refundable fees as high as $20,000 — to the state, but only 24 of those applicants will be ultimately be selected. The selection process is opaque, with the state providing relatively little information on how it will score applicants. It’s reminiscent of a past marijuana ballot initiative — Issue 3, backed by ResponsibleOhio and its human-sized marijuana mascot, Buddie — that failed in the state in 2015, Bryant and others say. That initiative would have allowed for only 10 pre-selected cultivators. 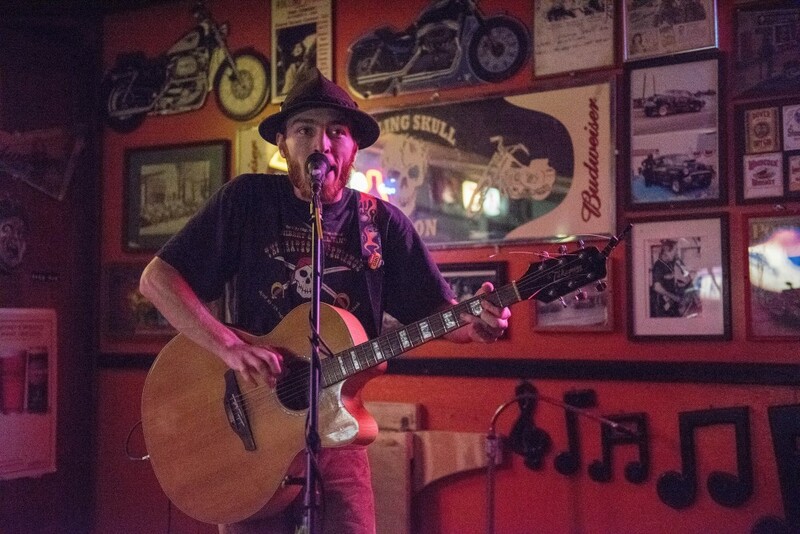 Caleb Brown, a key player behind the TACO ordinance, performs at open mic night at The Skull on Tuesday, Nov. 14, 2017. That thinking — that cannabis should be treated like a normal crop, and that most anyone should be allowed to grow it and use it — is what’s at the heart of a constitutional amendment that Brown and Bryant are pushing. The “Medicinal Cannabis and Industrial Hemp Amendment” would re-categorize marijuana in the state, moving it away from the realm of pharmaceuticals and making the state treat it more like alcohol, tobacco or traditional herbs. Bryant, Brown and a host of other Ohioans are behind a loosely organized coalition called Grassroots Ohio, which has been collecting petition signatures in a bid to get the amendment on the state ballot since 2016. The movement has lost momentum since Gov. John Kasich signed House Bill 523, which laid out the framework for the state’s medical marijuana system, into law in June 2016. But the more than 100 aspiring cannabis entrepreneurs who will soon have their cultivation applications rejected by the state could provide the spark Grassroots Ohio needs to make a push for the ballot box. The state’s current medical marijuana system looks roughly like this: Ohio’s government is in the process of picking a limited number of cultivators, processors and dispensary operators, all of which will be tightly regulated. Doctors must undergo specific training to recommend marijuana to patients. Patients can get pot to treat any of 21 state-approved conditions, which range from Alzheimer’s to HIV. That marijuana can be eaten or vaporized; it can’t be legally smoked. The system is supposed to be fully operational by fall 2018, though many don’t think that’s feasible. Ohio residents didn’t vote for or against the state’s medical marijuana laws — Gov. Kasich signed House Bill 523 less than a year after voters beat down the state’s first marijuana ballot initiative. Legalization advocacy groups like Grassroots Ohio and Ohio’s chapter of the National Organization for the Reform of Marijuana Laws (NORML), citing similarities between current law and the initiative that was struck down, are vocal about the laws’ problems. 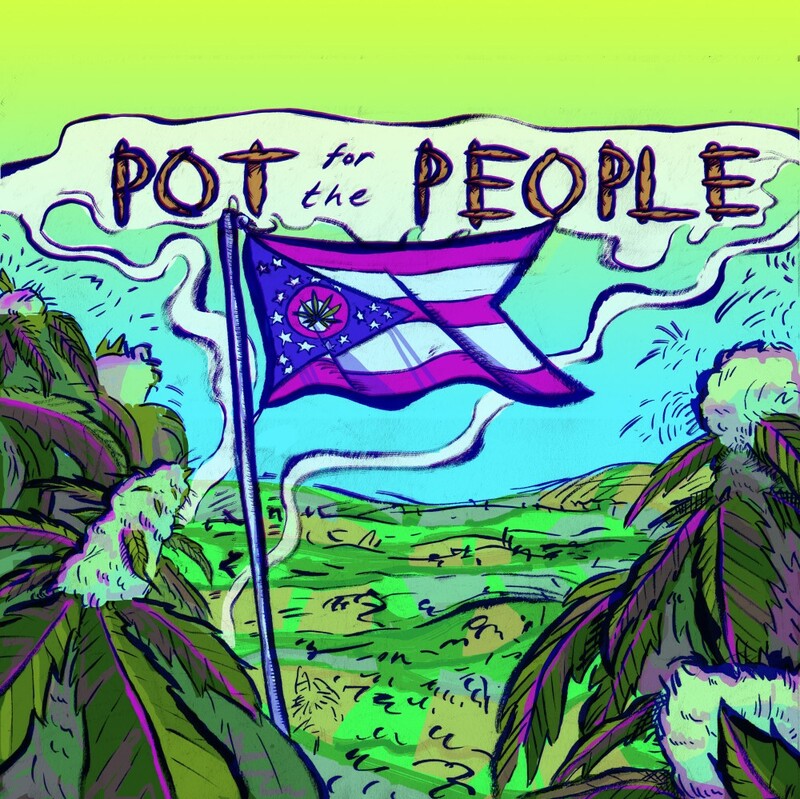 “Right now, I think the state of Ohio’s program — unless there are some major changes made — it has a very slim chance of success, and it’s going to take something like the Grassroots initiative to save the patients of Ohio,” said Jolie Moyer, communications director for Ohio NORML. Other than strict regulation and limited production — something Bryant says will result in a supply of “Walmart weed” — Moyer and Bryant point to the fact that patients aren’t able to grow marijuana themselves under the new law. “If you want to farm corn, you don’t have to pay $2 million; if you want to be a soybean farmer, you don’t have to get on a list of only a dozen producers. So it would be the same for cannabis,” said Brown. It’s difficult to tell exactly how the proposed amendment would interplay with the state’s current medical marijuana laws. Columbus-based Black Elk Biotech, which has applied for a large-scale grow license, is eying land in Athens County for a grow site and has agreed to pay an Ohio University laboratory $1.85 million to research cannabis on the company’s behalf, according to a previous Post report. Black Elk would be able to keep its planned grow operation under the amendment, Brown said. The amendment is steeped in the language of rights, as opposed to nitty-gritty specifics. “It’s rights-based, like gun rights,” said Bryant, who is the treasurer of Grassroots Ohio. “You have the right to possess your gun. You have the right to sell it at an auction.” With Grassroots’ amendment, the same would go for weed. In short, the amendment is a radical departure from the way most Americans seem to view marijuana. No other state’s marijuana laws work that way, and it’s tough to tell whether Ohioans would go for it. Plus, right now, the group doesn’t have the funding to commission polls or pay activists to collect signatures — but that could change. The state of Ohio is set this month to unveil the recipients of the cultivation licenses. Regardless of who the state picks, more than 150 applicants will be left disappointed, and one longtime cannabis activist thinks that could result in the funding Grassroots Ohio needs. “There are going to be hundreds of disappointed people here, Ohioans who pulled their money together to submit one of these applications, jumped through all the hoops and really had high hopes that … they could get one of these things, who aren’t going to get it,” said Don Wirtshafter, 66, a retired attorney who lives in Guysville. Wirtshafter explained that he thinks if a significant number of those spurned investors see what Grassroots’ amendment would do to marijuana policy in the state, they might throw their weight — and money — behind it, allowing the campaign to make a real push. “If it gets on the ballot, I’m very confident this will win,” Wirtshafter said. But getting it on the ballot is a tall order: The group will need to collect more than 300,000 signatures — some minimum amount from 44 counties in Ohio — in order to get it there. That’s a lot of legwork. It has fewer than 50,000 collected now. Brown is hoping that a local initiative will help build momentum in Grassroots Ohio’s favor. Bryant and Brown were two of the major motors behind The Athens Cannabis Ordinance, or TACO, an ordinance which lowers the penalty for misdemeanor marijuana charges in Athens to the lowest level allowed by state law, namely, a fine of $0 and limited court costs. TACO made it on the ballot by way of citizen petition — Brown estimates that of the roughly 600 signatures gathered by the ordinance’s backers, he collected around 300 himself. Prior to the Nov. 7 election, Brown had said he thought the result could serve as a gauge for citizens’ appetites for marijuana reform. If that’s true, then Athens really wants pot laws changed: The initiative passed with a landslide 77 percent of the vote — 2,000 for, 598 against. “It was telling that the cannabis ordinance received more votes than any of the candidates of the city of Athens,” Brown said after the results were finalized. That’s accurate: Athens City Council President Chris Knisely, who ran unopposed, received 1,984 votes. TACO is the latest in a string of similar city-level reforms that have passed in Ohio cities in recent years, starting with Toledo in 2015. TACO and similar ordinances in other cities don’t directly impact the state’s marijuana laws. But if their passage does help build momentum for Grassroots Ohio’s amendment, as Brown hopes, and if some 100 spurned would-be cultivators do flood the campaign with cash, the thing has a chance. Those are big “ifs,” though. Gov. John Kasich signs House Bill 523, the framework for Ohio’s medical marijuana system. Marijuana is technically legal for the treatment of 21 medical conditions in Ohio. Columbus-based Black Elk LLC says it’s considering eight acres of land near The Plains for a large-scale medical marijuana cultivation site. 185 entities apply for 24 total cultivator licenses. Ohio State Board of Pharmacy confirms Athens, Meigs and Vinton counties will share one dispensary, with 60 total across the state. Hocking College is the first school to announce it intends to serve as a marijuana testing facility for the state. Ohio State Medical Board finalizes rules for physicians concerning the recommendation of marijuana to patients. State begins announcing cultivation license recipients. Dispensary operator application period closes. Ohio’s medical marijuana program must be fully operational, per state law. Q: Who can use medical marijuana in Ohio? Medical marijuana can be used to treat any of 21 state-approved medical conditions. Those conditions are: AIDS, Alzheimer’s disease, cancer, chronic pain, chronic traumatic encephalopathy, Crohn’s disease, epilepsy, fibromyalgia, glaucoma, hepatitis C, HIV, inflammatory bowel disease, Lou Gehrig's disease, multiple sclerosis, Parkinson’s disease, post-traumatic stress disorder, sickle cell anemia, spinal cord disease or injury, Tourette’s syndrome, traumatic brain injury and ulcerative colitis. Those hoping to use medical pot will need to obtain a recommendation from a certified physician. Once they have the recommendation, patients will have to register for a medical marijuana identification card via a state system. Whether patients are or are not registered for the state’s program will remain confidential. Q: How do I buy medical marijuana? Patients who qualify to use medical marijuana will be able to purchase it at any state-licensed dispensary. As of September, the Ohio State Board of Pharmacy has determined there will be no more than 60 dispensaries across the state. “Ninety-day supply” is somewhat difficult to calculate and varies based on the form of the marijuana (oils, plant matter, etc.). But to give an estimate, most patients won’t be able to purchase more than eight ounces of the lowest-tier weed available — that is, marijuana with a THC content of no more than 23 percent — in a 90-day period. Q: Will there be a dispensary in Athens? It’s impossible to say. Business entities have until mid-December to apply for dispensary licenses — no one has received a license yet. We do know that Athens County will, at most, share only one dispensary with neighboring Meigs and Vinton counties. Athens is by far the most populous city in all three counties, but the state hasn’t indicated whether population will weigh on its licensing decisions. Q: Will I be able to smoke it in public? No. In fact, patients won’t be able to legally smoke medical marijuana at all. Ohio law allows for the use of “oils, tinctures, plant material, edibles and patches,” but specifically does not allow smoking. Vaping is legal. Q: Can I grow my own medical marijuana? No. There are no provisions for home growing in the state’s medical pot laws. Q: Isn’t weed already legal in Athens? I thought that’s what The Athens Cannabis Ordinance, or TACO, did. No. Strictly speaking, TACO has no bearing on the legality of marijuana in Athens. TACO only reduced the fine attached to a misdemeanor marijuana offense in the city to $0 and eliminated some court costs.